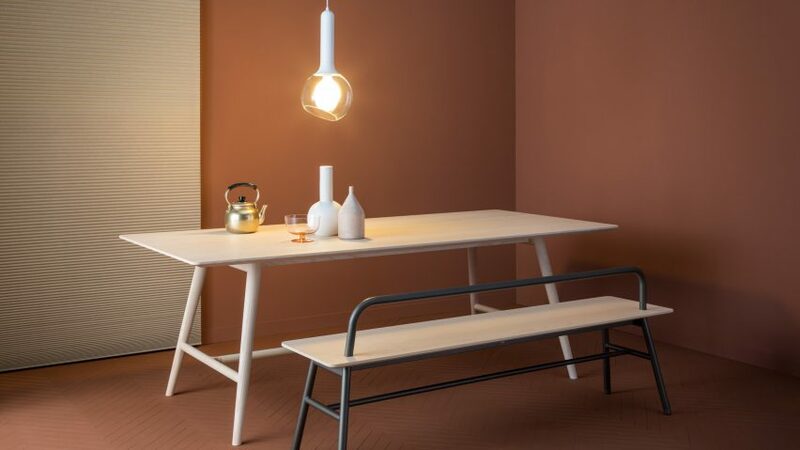 SP01's latest collection marries Italian craftsmanship with "Australian spirit"
Milan-based studio Metrica has created a collection of Italian-made furniture for Australian design brand, SP01 that it said "captures the spirit of the Australian lifestyle". Like all of SP01's furniture, the ten indoor furniture pieces, which include occasional chairs, armchairs, desks, benches and a sofa, are made in Italy. The pieces build upon an existing collection by the Italian studio that was debuted last year during the Salone del Mobile. While the original collection featured solid ash timbers and sculpted hand finished wood, the new additions incorporate satin metallic finishes such as pewter and brass and satin black steel combined with marble. When developing the new additions to the collection, Metrica – led by Lucio Quinzio Leonelli, managing partner, and Robin Rizzini, chief designer – said it wanted to reference the design of some of the collection's original pieces without simply replicating them. "We tried to progress and improve while retaining the spirit of the original collection that has an international DNA," said Rizzini. Matt Lorain, head of design at SP01, added: "Of the original eight pieces that Metrica designed, each really had the potential to be developed into its own collection, every piece had a very distinct character which gave us a lot of detail and design language to work with." "In the end, certain pieces naturally stood out with the strongest potential and so we developed new families from the original Thomas chair, Holland table and Anita armchair pieces," Lorain continued. "I think in the extension collection you can see both Metrica and SP01 are becoming more comfortable with the collaboration and while the pieces certainly retain a sense of simplicity, there is definitely a more unique character emerging." The Holland dining table that was launched last year is now joined by a desk, bench seat and console that, while incorporating a more complex material palette of Marquina and Carrara marble, reference the stance of the original table by using the same angles in the design of the legs. In the new iterations of the Anita and Thomas families of seating, the original forms have been preserved yet adapted. Anita is now also available in a high-back version and in both new versions Anita has been developed with a simple rod base that follows the contours of the chair and is designed to be reminiscent of a decorative 1950s style. The Max sofa from the original collection is now available in a corner version as well as an armchair. "The strength of SP01 is its specific positioning as a brand with an international collection but a very "local" sensibility for quality, taste and craftsmanship," said Rizzini. The Sydney-based brand states that like all of its collections, the Metrica pieces have an international appeal while also capturing "the spirit of the Australian lifestyle". "Australian architecture and interiors have a very unique style which is relaxed and refined and is essentially a reflection of our lifestyle," Lorrain told Dezeen. "We spent a lot of time with Metrica preparing briefing documentation which gave examples of Australian projects and the palettes that are used - predominantly with a base of natural materials, hard surfaces, beautiful light and considered use of colour." "There is something that resonates between Metrica’s reductive approach to design and the way in which SP01 view the world," continued Lorrain. "The strength of each of the new Metrica pieces lies in the pared back forms, simple expression of the materials and an uncomplicated approach to detail; it’s something that feels very natural to us." Since its launch in 2016 Sydney-based SP01 has worked with a host of designers including London-based industrial designer Tim Rundle, who created a collection that pairs plush fabrics with exposed metal frames for the brand. Last year the brand also collaborated with Brooklyn-based Ladies & Gentlemen Studio, which created a pastel-coloured installation in New York that featured their own product designs alongside Sp01's furniture.